There's something about Italian food that gives me that 'comfort' feeling. It's hearty, filling, and always hits the spot. Of course, it also typically includes gluten, grains, or cheese of some sort that's going to make me feel guilty (not to mention lethargic & bloated) the next day. 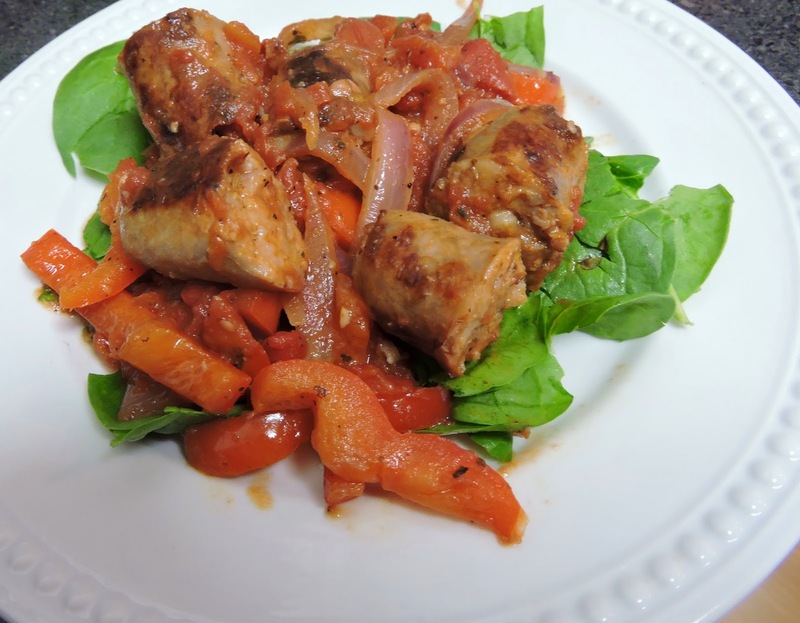 In comes one of my favorite dishes I've been making forever: "Sausage & Peppers". It's an Italian-American classic that is obviously delicious on toasted bread with melted cheese on top, but is equally tasty eaten straight from the bowl. Similar to a meat sauce, the pasta/bread is just not needed with this recipe. 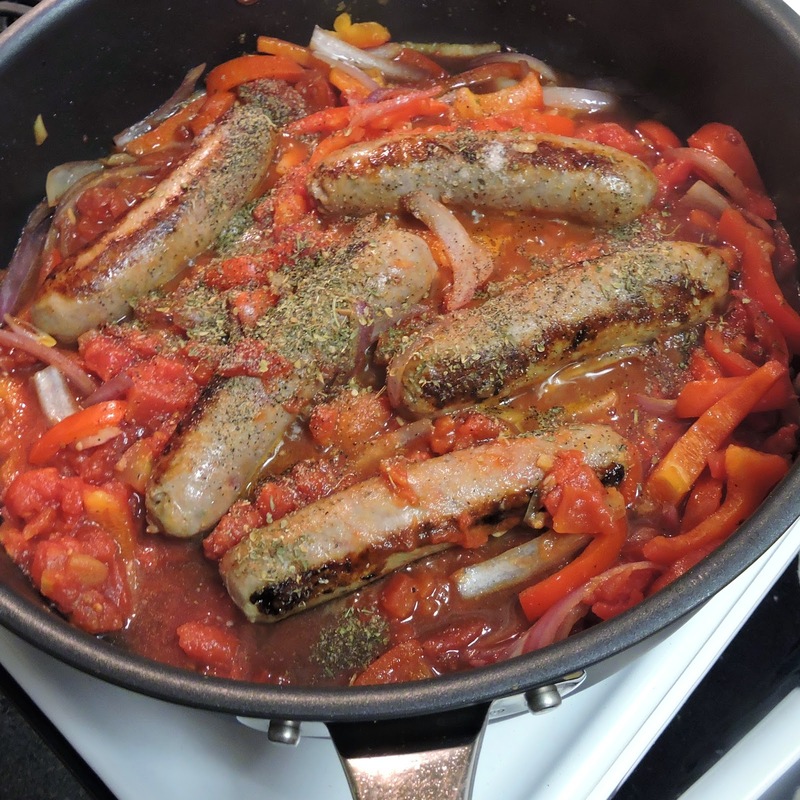 The savory Italian herbs, combined with rich tomatoes, fresh garlic, and sweet onions, create a perfect combination for the sausages to simmer in. Everything cooks in one dish, and it tastes just as good leftover as it does hot off the stove. Try this served over fresh spinach, zoodles, or spaghetti squash. I hope you love it as much as I do! Brown the sausages in a large skillet over medium high heat. Turn them continuously so they don't burn, not worrying if they cook all the way through (about 10 min). 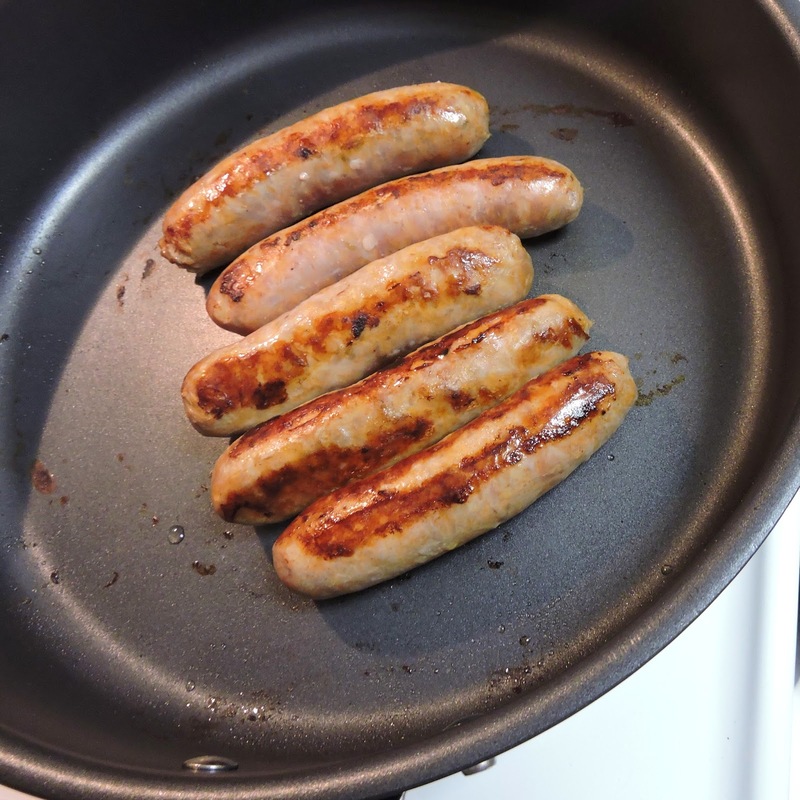 Remove the sausages and set them aside on a plate. Reduce the heat to medium, and add the EVOO. 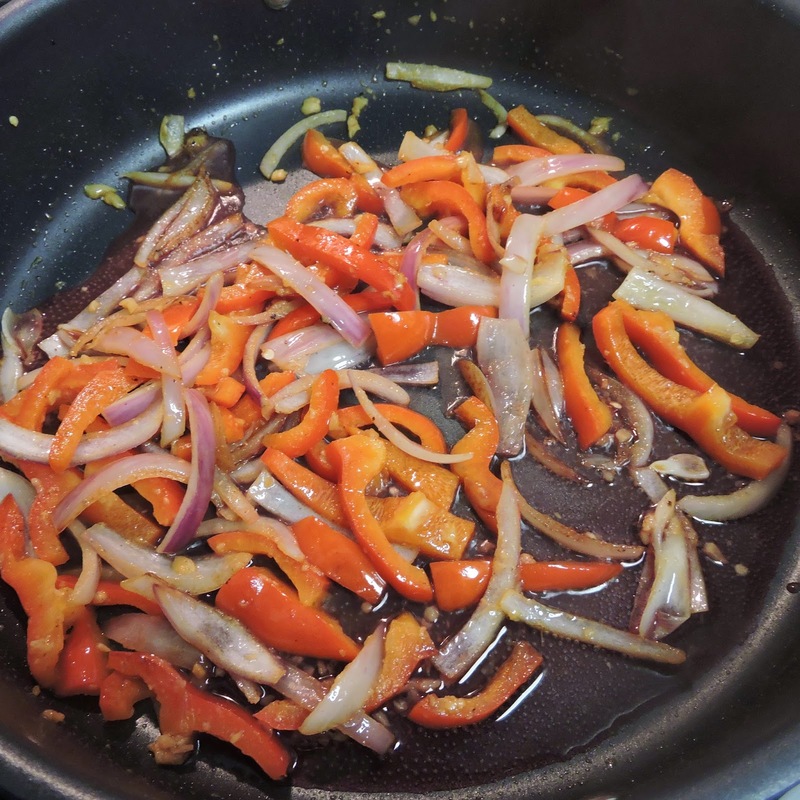 Toss in the sliced peppers and onion, and sauté for 3-4 minutes. Stir in the garlic, and sauté for an additional 2-3 minutes. Pour in a splash of wine (up to 1/3 cup), and simmer for about 2 minutes so the wine can reduce. Stir in the diced tomatoes, and add the sausages back into the pan- placing them amongst the veggies. Sprinkle your dish with Italian seasoning, salt, pepper, and red pepper flakes (optional). Cover, and reduce to a simmer until the sausage is fully cooked with no pink remaining (about 7-8 minutes). 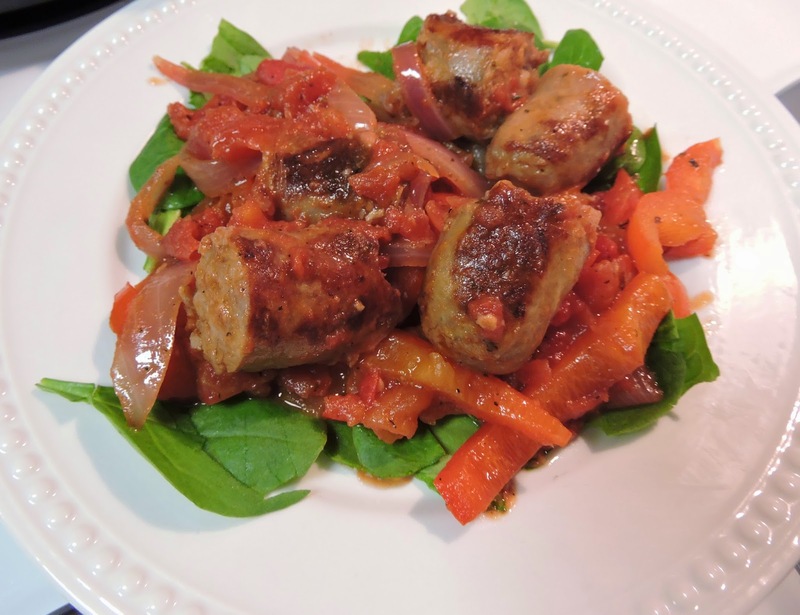 Slice the sausage into bite sized pieces (or dish them out whole), top with the pepper/onion mixture- and enjoy!